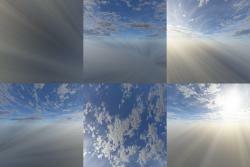 A six sided skybox of white clouds over a blue sky. Each texture is 1024 x 1024 in .bmp format. These were done in Terragen2. This skybox is simply beautiful. It was pretty much the only good realistic CC0 skybox available so I used it. I did add some realtime moving clouds to make the skybox a little less static and also block some of the bright sun, since the skybox sun is too bright.